The Rajas International School is an International School where learning is fun filled, meaningful and effective. At TRIS We constantly strive to incorporate innovative, creative, thinking and learning skills into our ever-evolving curriculum. 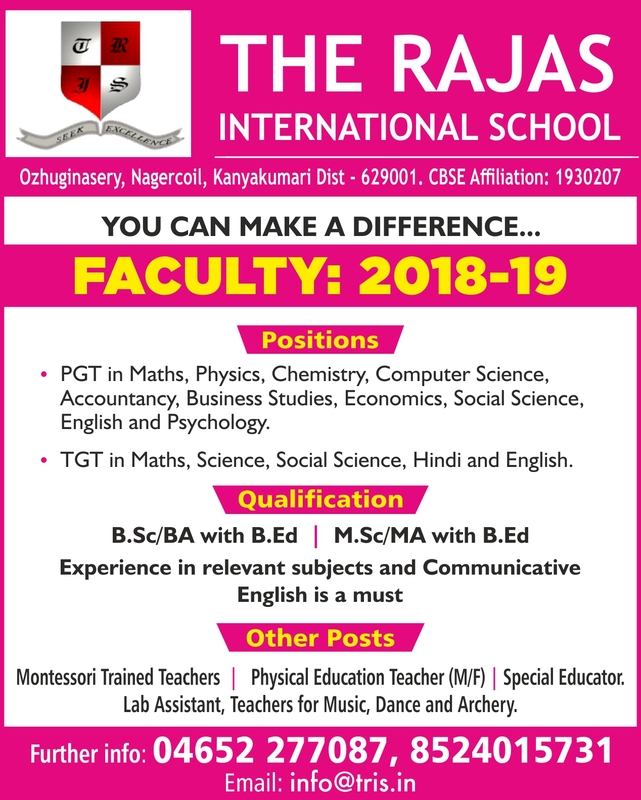 Following are the positions currently available at The Rajas International School for 2017-18. We are looking for highly motivated and skilled educators with experience in IGCSE/IB Curriculum. Kindergarten teachers with Montessori Training, fluency in English and a flair for Music, Art, Dance and Yoga only need apply. Qualified professionals with minimum 3-5 years of relevant experience are requested to apply at career@rajas.edu . Our HR Department will get back to you depending upon the requirement.